So the most common question is “Is there any chance of us staying in the shop?” There are three main issues which I can not see resolved in a way that could see us stay. Most important of all is competition. I’ve always said that FOPP and to a much lesser extent HMV are serious competition for us. Given some decent releases (Frightened Rabbit and Nick Cave) and a level playing field, last February was our best month for a long time. While we would always have expected to do well with Rick Redbeard when HMV and FOPP’s administrators deemed it not important enough to stock we noticed a big increase of people in the shop, commenting that FOPP didn’t have it, interestingly spotting other stuff they wanted as well and claiming they would have to come back soon. Few returned once FOPP started stocking most new releases again. The problem is simple. As is well documented all the Edinburgh HMVs were due to close as they were losing serious money. FOPP survived but even they have bills paid by HMV. HMV had a massive closing down sale but then landlords realising that the properties would be hard to get another tenant for offered low and often a period of no rent at all. Already shops are now being closed in January including Fort Kinnaird as these rent free periods end. At the same time record companies caved for demands for consignment so stock wasn’t paid for until sold. It simply isn’t possible to compete with shops that have prime locations but are not paying rent and not having to pay for stock. We have tried to concentrate on those areas where we have no competition from FOPP ie second hand and posters but at the same time new vinyl largely ignored and stuck in a corner has been much expanded (easy to do if you aren’t paying for it) so sales are overall lost there despite the general increase in vinyl sales. With a few exceptions like The National and Boards of Canada we have seen new release sales plummet and back catalogue sales drop dramatically. At the same time many titles out of stock with distributors were in plentiful supply in FOPP while other titles regularly appeared below cost price. Local band sales another staple and an area we faced little competition in also dropped considerably often to a third of previous sales if the band or label aggressively encouraged fans to buy directly before release so much so we had to introduce a stocking policy. Whether promoting a second album like the There Will Be Fireworks release or first albums by Quickbeam or recently Dead Flowers I think we have shown the benefits of giving us a fair chance to sell a release. All these bands and their labels had sales online as well as album launches but also promoted the fact we had the album in the shop and online which is all we ask. Whatever the future holds I expect to work with Bwani Junction and Withered Hand on their releases and of course Mogwai and Rock Action have given indies a bonus 7″ for their new vinyl which will certainly help. I’ll look to work even more closely with those bands who want to on not only their releases but also their merchandise and marketing. More of that later. Finally we moved to the Grassmarket with high hopes after so much money (4 millin pounds) had been spent and with the prospect of it becoming a BID area. Instead we had no sooner moved than the Christmas market was cancelled as all resources were used to support the festivities in Princes street suffering from the tram works. Clearly a big wheel, an ice rink and a German Market was not enough and the Grassmarket was left with nothing. This year and with the BID in place to protect our interests it got worse ! The council doesn’t seem to understand that by attracting peopel to one area it has to be attracting them away from others and I obviously don’t just mean the Grassmarket. With the new European market being such a huge disappointment to many with “every third stall the same” it is even more galling that the wide range of shops on offer in the Grassmarket has not been promoted. To say retailers are unhappy would be an understatement but I can’t see things improving as they stand. We’ve been offered better terms by some record companies (for which I am genuinely grateful) but still nothing to match those of HMV/FOPP. I should add our landlord also kindly offered not to put up the rent but it still leaves us lagging well behind in being able to compete on level terms. While Saturdays are normally very busy the rest of the week can be disastrously quiet and this is a general retail problem which again I can’t see improving. As a centre for promoting Scottish music the shop could exist where it is as it is well located for that but as a straight forward retail unit the odds are just stacked too heavily against it given the triple whammy of HMV’s terms, the council’s lack of support for the area and the more general problems of the high street. While the lack of support from some local bands and labels is unhelpful it is not as crucial as these other factors. It does have to be said though that the continual support of bands like Frightened Rabbit, Withered Hand, Ballboy, Admiral Fallow, Olympic Swimmers and others have made life a lot easier. Chemikal Underground and Rock Action along with other smaller labels have also been a great help. Again I am very grateful to them all. 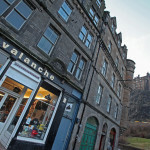 I have now been approached by other retailers asking me to stay and as you can probably tell I firmly believe in the Grassmarket but I see no way to overcome the challenges faced in our curent location.